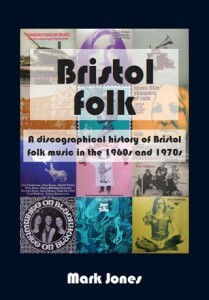 An excellent book written by Gran Fan Mark Jones was published earlier this month and is recommended to all those interested in the Bristol folk scene of the the Sixties and Seventies. · In-depth profiles of over 30 artists and coverage of many more. · Personal reminiscences from many of those on the scene. · 34 pages of illustrations, including many previously unpublished photographs. · Histories of the numerous folk clubs and the two main local record labels. · A comprehensive discography listing more than 180 records. · A listing of CD re-issues and artists’ current websites. In the late 1960s and early ‘70s, Bristol became nationally renowned for its powerhouse folk & blues scene, and was second only to London for the number and influence of its recorded artists. It’s an era still remembered with enormous nostalgia by those who participated, and is nigh legendary to those who came later. Although focused on Bristol, Bristol Folk should be of great interest, not just to Bristolians, but to all fans of late 1960s and early 1970s British folk and blues music, not to mention that strange beast now known as ‘psych’ or ‘acid folk’, because many Bristol-based musicians became nationally-known and influential exponents of these various styles. Bristol, because of the national reputation of its folk scene, became a magnet for the brightest and best on the folk scene: established names such as Al Stewart, Stefan Grossman, the Incredible String Band and John Renbourn were enamoured of Bristol’s friendly folk scene and were frequent visitors to clubs, such as the Troubadour, where they were often given a run for their money by Bristol’s own resident musicians, many of whom went on to become national names themselves. 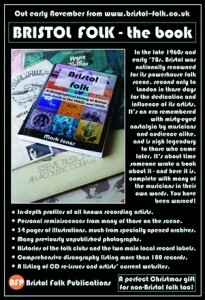 Bristol Folk, by music historian and discographer, Mark Jones, features painstakingly researched profiles of all the artists known to have recorded in and around Bristol’s vibrant folk scene in those two decades: from Ian Anderson’s country blues to the manic 1920s jug-based jazz of the Pigsty Hill Light Orchestra; from Adge Cutler & the Wurzels’ novelty rural folk to the sophisticated images of Shelagh McDonald; from the rustic rock of Stackridge to the finely-crafted ‘psych blues’ of Al Jones; from the magical ballads of Bob Stewart to ethereal pop hits by Sally Oldfield; from the inspired, original guitar work of Dave Evans to the ‘acid folk’ of Keith Christmas – and much more. These are discussed in the context of the wider music scene, with mention of the numerous and often vastly-popular groups and artists who either didn’t get to release records in their own right or had them issued outside of the years covered, from Canton Trig to the Deep Blues Band and many others. Amongst those who contributed specially-written pieces – included in addition to their profiles – are Ian Anderson, Andy Leggett, Saydisc’s Gef Lucena, Rodney Matthews (yes, the world-famous fantasy artist started out designing LP sleeves and gig posters for Bristol’s folk set), Bob Stewart, Steve Tilston, Keith Warmington and Fred Wedlock, all of whose diverse careers either started in Bristol or were shaped by their time on Bristol’s folk scene. For more information follow this link http://www.bristol-folk.co.uk/index.html Published November 2009, by Bristol Folk Publications, price £18.99 (+ shipping).